Dita Von Teese possesses the total package. She’s the absolute babe of old-fashioned glamour. You never see her wearing anything less than immaculate – think of sweatpants. But many have asked her in different interviews if she ever wears those, and she answers yes. Dita has always loved dressing up and looking fab since she was a little girl. She just brought it up with her as she grew older. There’s nothing wrong with that since she became the embodiment of confidence, glamour, style and brains. 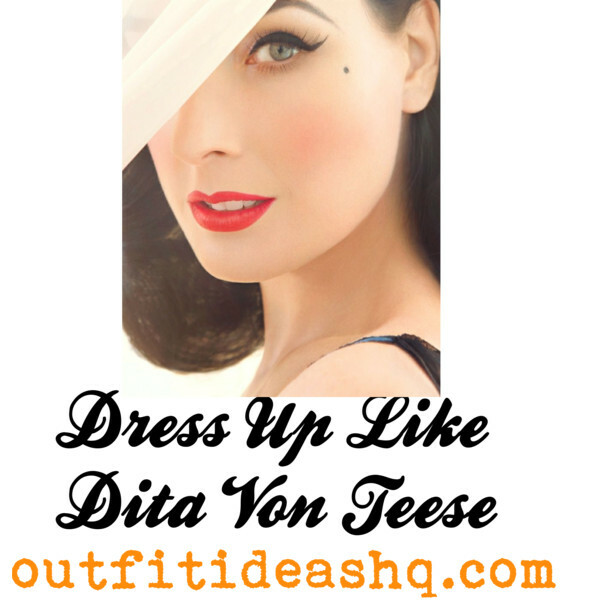 Just like us here at OutfitIdeasHQ, many women idolize Dita and just can’t get enough of her. Because of that, we rounded up 10 of our favorite Dita Von Teese best looks and some tips on how to dress like our favorite femme fatale. 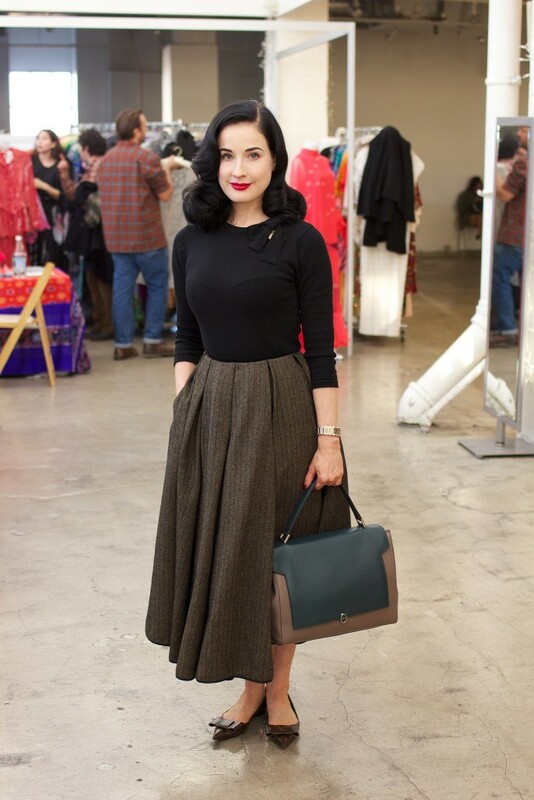 Dita Von Teese is elegant – she likes the style from the 40s and 50s but kinds of modernize it a bit and it is still awesome. To dress like this retro goddess, wear simple but stylish dresses and smart shoes. Have you seen Dita in messy hair and running mascara? Neither did us. Even when she just strolls the streets for a walk or just simply going to the grocery, she always looks perfectly groomed. Dita always takes time to check her appearance and make herself super presentable everyday and you can also look great by brushing your hair, putting some lipstick and some mascara to give your eyes that much needed lift. When it comes to accessories and achieves the Dita Von Teese look, all you need is to carry a smart handbag or clutch. Less is more when it comes to her fashion and you don’t need too much jewelry on you if you want to steal her style. Copy Dita’s 40s hairstyle if you have the patience to style your hair today. That means, use curlers or styling tongs to achieve the perfect retro pinup hairstyle. Dita’s makeup is always amazing. She highlights her beautiful pale complexion by protecting her skin from the sun. Her face is always matte so make sure to powder your face to set your foundation, some mascara, liquid eyeliner and don’t forget her statement bold red lipstick. As mentioned, Dita’s style is more of girly dresses and skirts that are simple with beautiful cuts. She’s hardly ever seen in jeans. Sometimes we see Dita wear flats but most of the time, she wears high heels. Have you seen her in trainers? Yes, neither has us as well. To achieve her look, just get yourself a pair of elegant heels. It doesn’t have to be sky high like hers. Her super shades are super spectacular. She often wears vintage-style sunglasses. You can look for inspired ones from vintage stores and eBay. To achieve the retro look, cat-eye frame is what you really need. Dita is one of those people who always dress beautifully and nobody can hate her for it because she looks absolutely stunning in every single one of her outfit. Not everyone can have the time and effort to dress up like that everyday but it surely feels refreshing to see somebody so beautiful can even look more beautiful. You don’t need to copy all her style – some of it is enough. Just do whatever makes you comfortable because that’s what Dita Von Teese always does.